The Cygnus OA-7 cargo craft is delivering the first group of 28 operational QB50 CubeSats to the International Space Station for deployment in May 2017, to be followed by the launch of another eight satellites atop an Indian PSLV in late May to complete the space segment. 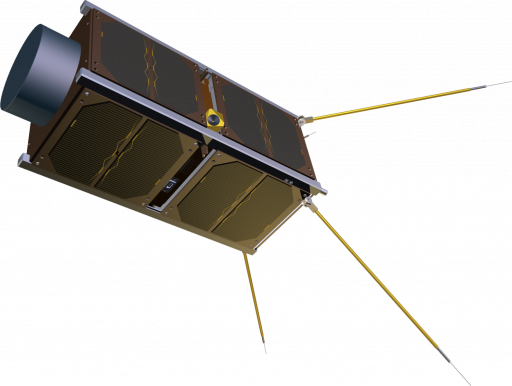 QB50 is a program of the Van Karman Institute, funded by the European Commission under the 7th Framework Program, and aims to establish an international network of CubeSats to collect multi-point measurements of Earth’s lower thermosphere. The introduction of CubeSats into scientific research enables the creation of loose constellations with many members, allowing for measurements impossible with large, expensive science satellites. 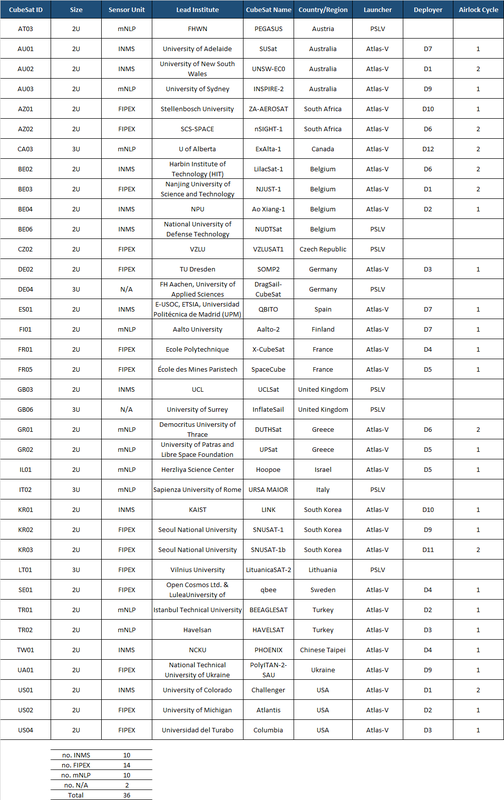 QB50 was formally initiated in February 2012 when the Request for Proposals was sent out by the Von Karman Institute, outlining a constellation of 50 CubeSats from various universities and institutions with identical science instruments to collect an unprecedented data set of in-situ measurements in the lower thermosphere, 90 to 380 Kilometers in altitude. A pair of precursor satellites were launched aboard a Dnepr rocket in 2014 to validate the performance of the six science instruments chosen for the QB50 mission. 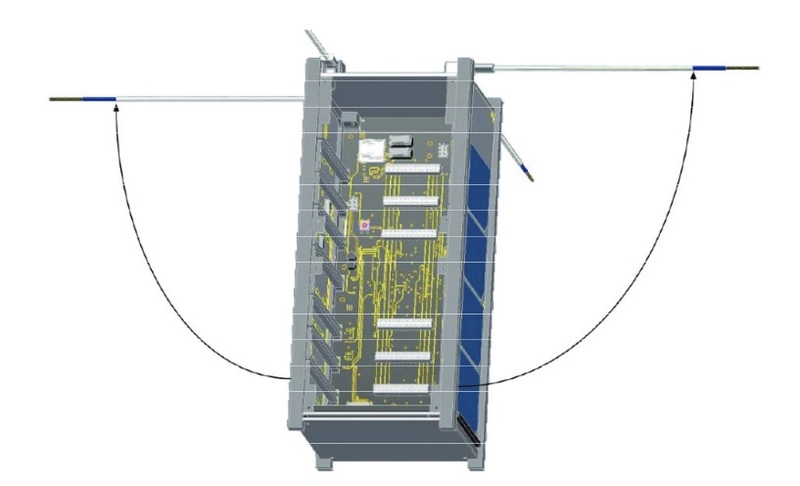 The initial plan called for all QB50 satellites launching aboard a Cyclone-4 rocket from Alcantara, Brazil, however, the project of bringing the Ukrainian launch vehicle to a Brazilian spaceport was ultimately abandoned due to a lack of funding. 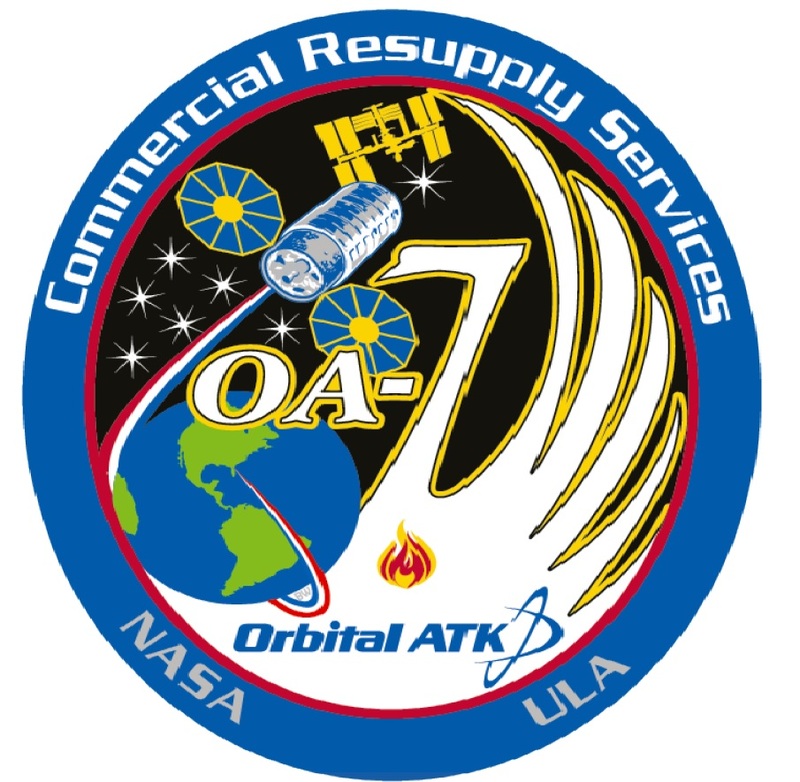 The revised plan for QB50 is to launch 28 constellation craft on Cygnus OA-7 for release from ISS in May into a 400-Kilometer orbit at a 51.6-degree inclination and send another eight satellites into a Sun Synchronous Orbit at 500 Kilometers as secondary payloads on a PSLV launch. The QB50 Project has four core objectives – facilitating access to space, scientific research, in-orbit demonstration and education. Under the framework of QB50, development of the QuadPack CubeSat deployment system was facilitated, simplifying the integration of multiple CubeSat payloads and providing compatibility with virtually any launch vehicle currently on the market. The educational objective of QB50 was accomplished by allowing a large number of universities to participate in the program, thus raising the number of individual students who received hands-on experience in the development of a satellite mission. The third objective of QB50 is to serve as a platform for technology development and demonstration, facilitated by selecting a handful of satellites that are not part of the core constellation and pursue other goals such as demonstrating thermal protection systems, in-space navigation systems & formation-flying, and deployable elements, e.g. sails. Remote sensing instruments like radiometers and active scatterometers are powerful tools to capture vertical profiles of the lower atmosphere up to 100 Kilometers where air density is sufficient to create a measurable return signal. The same applies for ground-based observatories. 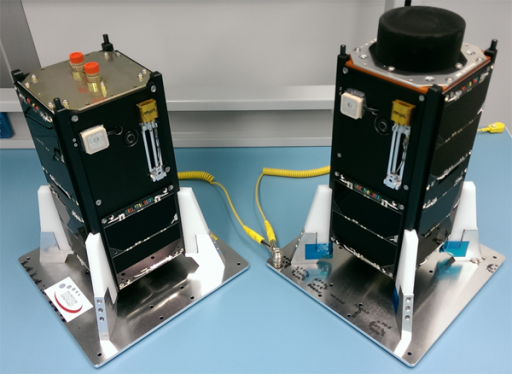 The introduction of the CubeSat form factor and technical advances in miniaturizing instruments allows a constellation of in-situ spacecraft to be realized at realistic cost. QB50 will operate a loose constellation (without active control of the satellite orbits) to collect global measurements of the thermosphere over a period of several months. Combined with data from other sensors, QB50 will deliver a tremendous amount of information for modeling Earth’s atmosphere and further the current understanding of atmospheric processes benefiting a multitude of applications. Three different types of science sensors, each part of a science set, will be used to carry out measurements in the lower thermosphere – a Ion-Neutral Mass Spectrometer (INMS), Flux-Φ-Probe Experiment (FIPEX) and multi-Needle Langmuir Probe (m-NLP). Each of these instruments is part of a science set together with Thermistors/thermocouples/RTD (TH). The Ion-Neutral Mass Spectrometer (INMS) is a miniaturized analyzer for low mass ionized and neutral particles in the spacecraft ram direction with the resolving power to identify the influx of the major constituents in the lower thermosphere such as atomic and molecular oxygen, nitrogen and oxides of nitrogen. 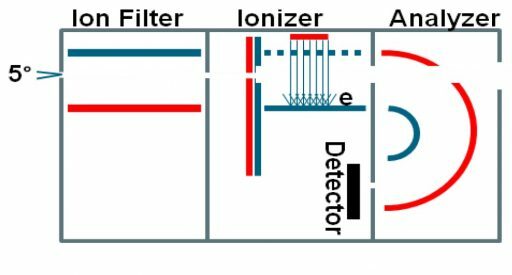 INMS comprises a collimator/ion filter, an ionizer and a charged particle spectrometer. Particles enter the INMS sensor into the ion filter where charged particles can be rejected while neutrals pass a series of baffles for collimation and further charged particle rejection. A 50eV electron beam ionizes neutral species which then travel through an electrostatic analyzer where they are separated by mass. INMS achieves an elevation and azimuth resolution of 5 degrees and samples particles at energies of 0.1 to 28 electronvolts with an energy resolution better than 3% – allowing for a clean separation of the major thermospheric constituents. The instrument sweeps through its energy range once per second with 256 discrete energy sweep steps, corresponding to a 4ms sampling time. The Flux-Φ-Probe Experiment (FIPEX) was designed at TU Dresden, Germany to distinguish and measure the time-resolved behavior of atomic and molecular oxygen as a key parameter for various processes in the lower thermosphere. Atomic oxygen is the dominant species in these regions and responsible for a number of atmospheric processes relevant for modeling. Additionally, erosion of spacecraft surfaces is caused by atomic oxygen and in-situ measurements of the species will benefit the construction of future spacecraft equipped to withstand the Low Earth Orbit environment for prolonged mission durations. 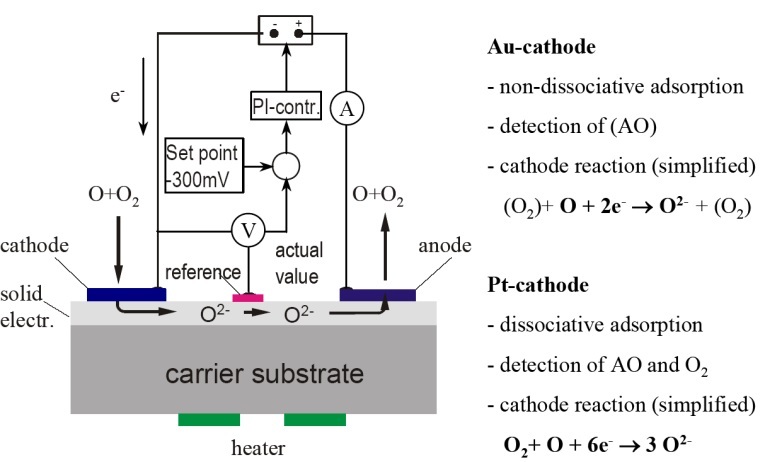 FIPEX uses a gold cathode for non-dissociative reactions to detect atomic oxygen and a platinum anode for dissociative adsorption to detect atomic and molecular oxygen. The working principle of the sensor is based on the ion conductivity of ceramic materials, allowing oxygen to be pumped from one electrode to the other by applying a direct voltage while measuring the current which corresponds to the mass influx of oxygen. Taking place at the gold cathode is the non-dissociative adsorption of atomic oxygen while the platinum cathode encounters dissociative detection of atomic and molecular oxygen. This allows the precise influx of both species to be easily calculated provided proper calibration for both measurement circuits. The FIPEX sensor is 20 x 3.5 x 0.5 mm in size and requires a heater power of under 1.6 Watts to heat the yttrium-doped zirconia carrier substrate to 660°C. All in all, the FIPEX instrument is 80 x 100 x 10 millimeters in size and comprises a pair of sensors, one acting as a spare. The instrument weighs around 70 grams and is capable of providing measurement down to oxygen partial pressures of 10^-10 mbar. The multi-Needle Langmuir Probe (m-NLP) from the University of Oslo can provide measurements of the absolute electron density at a spatial resolution of around one meter, allowing detailed maps of plasma turbulence phenomena to be created on a global scale. Langmuir probes can determine electron temperature, electron densities and the electric potential of a plasma. Two or more electrodes are inserted into a plasma environment. The electrodes have a constant or time-varying electric potential between them to allow the determination of physical plasma properties by measuring currents and potentials in this electrode system. A bias voltage is applied to the probe and the resulting current that is measured is proportional to plasma charge density. 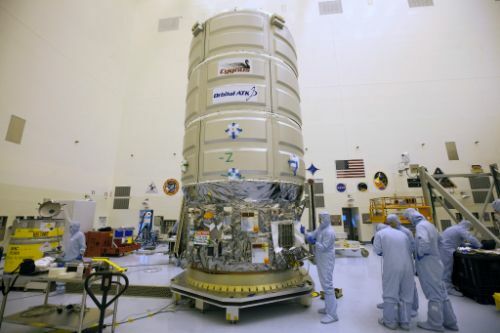 The m-NLP instrument uses four eight-centimeter long booms, 2.2mm in diameter, holding the probes in front of the satellite’s shock front, each with a different bias potential relative to the satellite platform potential. The current is collected individually from all four needle probes which allows measurements to be completed at very high time resolution and also eliminates the need for actively controlling the spacecraft potential. 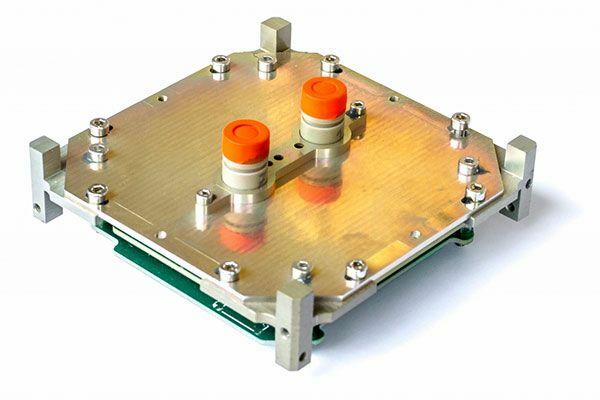 m-NLP comprises the four booms, an aluminum cover plate, a printed circuit board for mounting of the four probes and a PCB hosting the instrument electronics. Currents of 1 nanoampere to 2 microamperes can be measured by the instrument at a sampling rate of up to 7kHz, creating a spatial resolution of 1.1 meters. The four booms are held in place on the side of the spacecraft for launch and spring into place after being released by burn wires. At the top of the payload sits an electron emitter that rids the satellite of its negative potential caused by electrons collected by the probes. While in sunlight, photoemission keeps the satellite potential within allowable limits, but during nighttime, periodic electron emission is required when the CubeSat floating potential drops to a too negative a level. 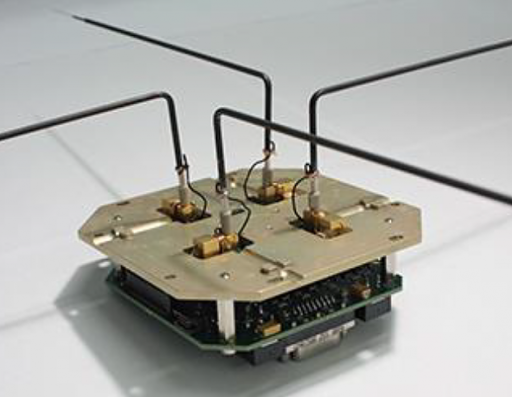 All QB50 satellites are outfitted with thermistors, thermocouples and resistance temperature detectors to precisely characterize the external temperature of the satellites for flow field modeling. The surface of the satellite reflects particles of the surrounding atmosphere, creating a reflected beam that modifies the atmospheric environment in the vicinity of the satellite and influences measurements by the other sensors. 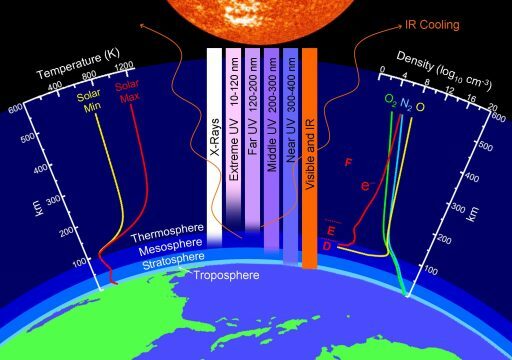 Therefore, an accurate reading of the satellite surface temperature is needed to assess the reflected beam properties and correct data from the other instruments accordingly. Some instruments also needed temperature measurements due to their temperature-dependent working principle.